The Japanese take their food very seriously. Focusing on freshness and quality of ingredients, the key is to showcase the food itself. Anyone who as been to a good Japanese restaurant or sushi bar has seen the minimalist presentation that the chef uses, as well as experienced the flavor of the food without heavy sauces or elaborate preparations that are the hallmark of foods from other countries. In Oishinbo A La Carte: Japanese Cuisine, the reader is treated to the finest that Japan has to offer. When simplicity is the key, every detail matters. In Basic Knife Skills, an American named Jeff Larson has traveled to Japan to train as a chef. He's taken to a restaurant that mimics the Rodeo Drive aesthetic of California, and the chef there has an amazingly flamboyant presentation style. Unfortunately, the flavor leaves something to be desired. Will Jeff find a new place to train, and discover what went wrong at that first restaurant? In The Right to Be a Chef, we meet the younger brother of a restaurateur called Ryozo. He had been apprenticed at one of the most prestigious gourmet clubs in Tokyo, but was ejected without any reason being given. Heartbroken, he's returned to his brother's restaurant to continue to train. Will he figure out what his fatal flaw is, and be able to return to the gourmet club? The Ultimate Etiquette focuses on a part of a meal that many people overlook. While the taste of the food is important, the presentation of the food can be just as critical. Unlike in Western cuisine, the Japanese take great pains in choosing the best shape, color, and material of dishes in which to present their food. Even the chopsticks being used is a decision that a chef has to make. The overarching plot of this is fairly thin. Yamaoka Shiro, a journalist working in Tokyo, is tasked with the mission of developing the Ultimate Menu as part of his newspaper's 100th anniversary celebration. As the son of one of Japan's most renown chefs, he seems the perfect choice for the task. What his bosses may not realize, however, is that he's badly estranged from his father, and this assignment causes their paths to cross much more often then either would like. Often accompanied by a female journalist, Shiro ends up in some of the best restaurants, and often has a lesson to teach either a dining partner or a chef. 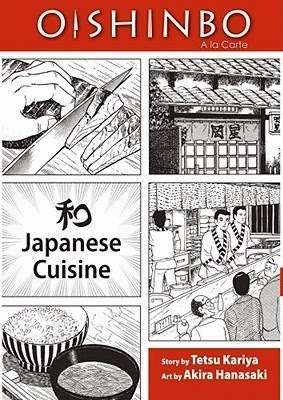 When Viz published this title, rather than simply publishing the chapters in order, they pulled chapters with thematic and culinary similarities into volumes based on topics like 'Sake' and 'Ramen and Gyoza.' While this 'best-of' format may have been the only way to publish a series that has been in print for 30 years, it makes the continuity of the main characters very hard to follow. Rather, the reader should simply focus on the situation in from of him, and not worry about the rest of it. Nevertheless, Oishinbo is an in-depth look into the world of fine dining guaranteed to make the reader hungry. Highs: As amazing as Shiro's skills are, it's fun to see him one-upped every so often. Lows: Having the chapters presented out of order, with very little background into the lives of our protagonists, takes a bit of getting used to. Verdict: One of the best ways to experience a culture is through its food, and Oishinbo is a welcome peek into Japan that most manga doesn't cover.